Two signed typed letters by J.D. Salinger (1919-2010) have come to market. 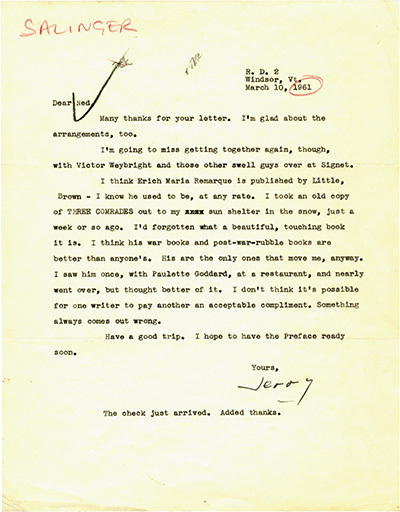 Salinger autograph material is highly desirable and scarce, and, as with all author (or historical figure) letters, market value is tied to content, the richer and more revealing and insightful the more collectible - and expensive. The letters are being offered for $9,750 and $15,000 respectively, the moola in the rye. On May 13, 1961, Salinger, writing from his home in Windsor, Vermont to his editor at Little, Brown, Ned Bradford, about the publication of his collection, Raise High the Roof Beam, Carpenters and Seymour - an Introduction, expressed his feelings about book club deals. Dorothy told me about the Readers' Subscription Book Club offer, the same day, I think, that she told me about the Book of the Month Club offer. I told her I preferred to have nothing to do with book clubs, any book clubs, but she may have thought I meant only the Book of the Month. The Book Find Club offer is so horrible it's almost beautiful. Anyway, thanks for passing the word along. I think the book will do well enough without its getting mixed up in book club affairs. It may take a little longer, out on its own, but I think it's going to move along. I hope you feel so, too. Salinger was right. Raise High the Roof Beam, Carpenters and Seymour - an Introduction, ultimately published in 1963, didn't need book club support. At this point, Salinger could do no wrong; the book became a best-seller. As did its predecessor, Franny and Zooey, in 1961. 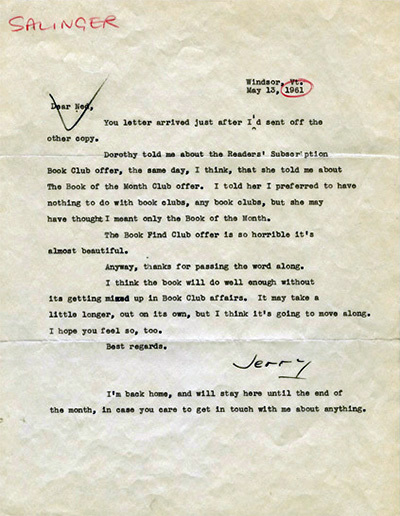 On March 10, 1961, two weeks before writing to Ned Bradford about book clubs, Salinger wrote the editor a note regarding paperback rights. Writing also from his home on Rural Delivery 2, Windsor, VT, he was unhappy with what Signet had done with Catcher in the Rye. The cover illustration and blurb - "This unusual book may shock you...but you will never forget it!" - deeply offended him. He transferred paperback rights to Bantam. After thanking Bradford for making the new arrangement, he takes a sarcastic swipe at Signet. I'm going to miss getting together again, though, with Victor Weybright and those other swell guys at Signet. Salinger then goes into fan-boy mode, expressing his love for the work of German novelist Erich Maria Remarque. I took an old copy of Three Comrades out to my sun shelter in the snow, just a week or so ago. I'd forgotten what a beautiful, touching book it is. I think his war books and post-war-rubble books are better than anyone's. His are the only ones that move me, anyway. I saw him once, with Paulette Goddard, at a restaurant, and nearly went over, but thought better of it. I don't think it's possible for one writer to pay another an acceptable compliment. Something always seems to go wrong. Have a good trip. I hope to have the Preface ready soon. That preface was for the first edition in book form of Franny and Zooey, published by Little, Brown five months later in July, 1961. Both letters have "Salinger" penciled at upper left and year circled, in red: Bradford file notes. 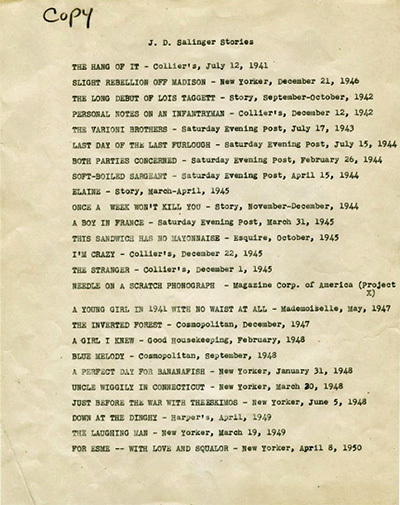 Included with the book club letter is a copy of a typed bibliography compiled by Salinger of his short stories to date that he sent to accompany the note to Bradford. Each letter is significant in its own way. That Salinger decided to avoid selling book club rights to Raise High the Roof Beam... was a major risk for a novelist at a time when book club sales were considered fundamental to a book's commercial success. And we rarely get an opportunity to peek into Salinger's view of authors he admired, and certainly to learn of his reticence to meet Remarque and express his pleasure; you can almost feel his tongue tie-up at the thought of approaching him - though the prospect of meeting beautiful brainiac Paulette Goddard (who married Remarque in 1958) may have been too much to bear. Images courtesy of Royal Books, currently offering these letters, with our thanks.